When you sell one of the best CNC machining tools in the world, you want your customers to be completely satisfied with the entire package. But that wasn’t happening for Hanwha Machine Tool USA of Pewaukee, Wisconsin. They are the importer and head up the US and Canadian dealer network for Hanwha, Swill-style machining tools, which are manufactured in Korea. These high-end, sliding head stock tools are used to machine small precision parts and long, small diameter parts – ranging from connectors for the telecommunications industry to medical specialty items like bone screws. Hanwha USA’s customers love the CNC machine, but weren’t as happy with the Korean-built in-feed and takeaway conveyors that came with the system. The conveyors often weren’t the exact size that customers wanted. The belts had to be adjusted almost constantly or they’d track wrong, causing deterioration along the sides. Sometimes, small parts dropped off the sides, resulting in belt damage. Fortunately, Hanwha USA found the perfect solution just a few miles down the road – Dorner manufacturing in nearby Hartland, Wisconsin. The Dorner 2200 Series offers just what Hanwha USA needs: customized solutions for each situation. These low-profile conveyors can be ordered in virtually any length increment, instead of the restrictive one-foot increments of some manufacturers. 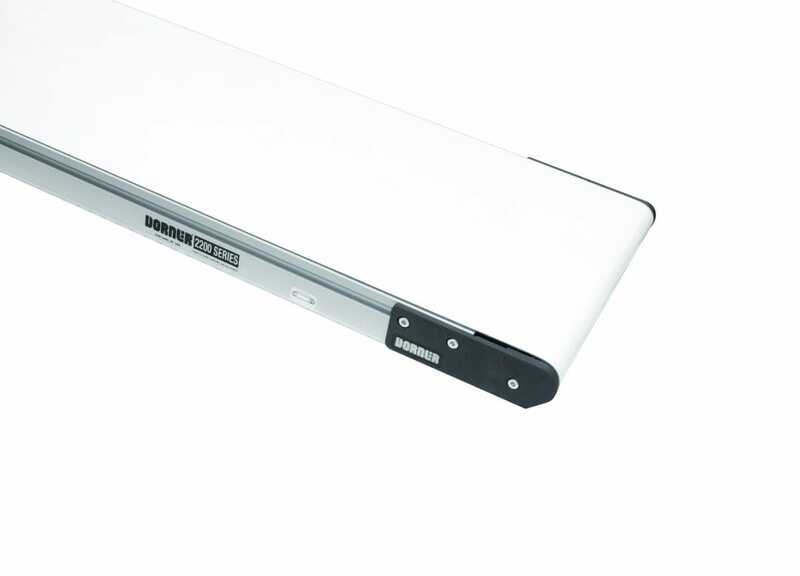 The extruded aluminum T-slots make it easy to add guides or other accessories to the conveyor. Dorner’s V-guided, self-tracking belt stays perfectly aligned without adjustment. And with Dorner’s depth of expertise and service, 2200 Series conveyors can be tailored even further for specialized applications.